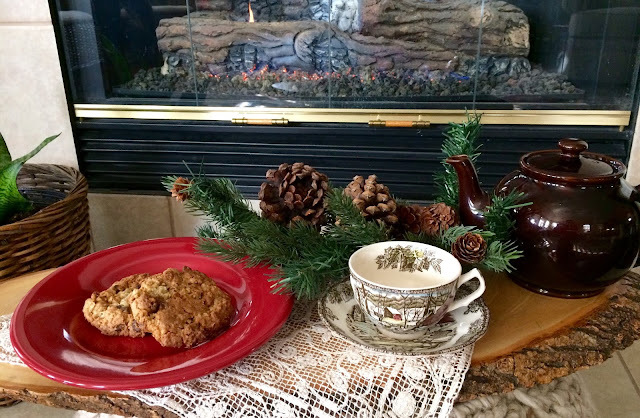 Let's stay warm and cozy by the fire today, and have a cookie, with a cup of hot tea. I'm still using some greenery and pine cones until I put out some Valentine decor. We had freezing temperatures, and some snow here in Texas! My Johnson Brothers Friendly Village is a favorite wintertime teacup. These cookies are crunchy and crisp on the outside, but chewy on the inside. I form them into balls, put them on parchment paper, slightly smash them, and freeze them. When frozen, I then transfer them to freeze-proof containers or storage bags. When I want a fresh-baked cookies, I bake one on parchment paper...oh, so good! Preheat your oven to 375 degrees. Lightly grease (or line with parchment) four baking sheets, or as many as you have. Beat together the butter, sugars, baking powder, baking soda, and salt. Add the oats and flour to the butter mixture, then stir in the cinnamon chips, chocolate chips, and chopped walnuts. Drop the dough by tablespoonfuls, 2" apart, onto the prepared baking sheets. ( I use an ice cream scoop for large cookies). Bake the cookies for about 12 minutes, until they're just set. (The large cookies will take a few extra minutes). They may be barely starting to brown around the edges. Remove the cookies from the oven, and cool. This is a great way to use up those partial bags of chocolate, cinnamon, white chocolate, butterscotch or peanut butter chips that you may have in your pantry! These looks delicious and especially during this cold snowy winter! YUM on those cookies Kitty! Oh I can taste them I do believe! Well, wishful thinking anyway. Love your tea cup and saucer. I have one just like that that sits in my little room and was given to me by Celeste in one of Stephanie's tea cup exchanges. Love it! Hugs and blessings to you dear friend. What? I had to reread twice just to let it sink in that you sometimes bake just one cookie! Superb idea. This recipe sounds wonderful. Mom has some snow in Arizona a few weeks ago, it's not her favorite. Oatmeal cookies, one of my favourites! Yummy!I would love to have tea with you in that gorgeous teacup and with those delicious cookies!Hugs,Kitty! I love the JB Friendly Village patterns too! My mom has Friendly Village 6 mugs and 4 teacups/saucers. I always keep an eye out for the matching teapot! Yum...I feel the pounds piling on my hips just looking at them, but it would be worth it! Kitty, your wintry teacup is perfect for tea in this weather! And those cookie look healthy and delicious. I think I'd just forget my diet and chow down on them! This looks like a delicious cookies. I do have a few bags of left over chips so I will be trying. I don’t think I have ever left a comment on your blog. I love opening it each week to see what you are baking with your sweet grandchildren. The recipes are great too! I love that you freeze them ahead of time, then take them out as you want to bake them. And, I wouldn't have thought to put the various chips into the oatmeal cookies. You always help me see ways to think out of the box, and it is so refreshing! Thank you for your precious blog and for always lifting my spirits when I stop by here. God bless you, sweet friend! Cookies and tea-a winning combination! 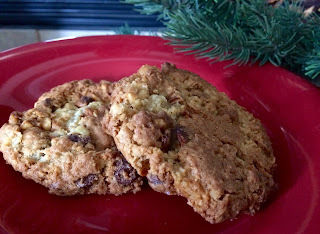 Love the variation of the traditional oatmeal cookie recipe. My eyes were immediately drawn to your Brown Betty teapot. To me it's the perfect winter time teapot. I would love to acquire one some day. Stay warm and thanks for sharing! These are my kind of cookie! Printed and on my list to bake. Thanks for the recipe! A pretty tea by the fire would be a perfect way to spend an hour or two this afternoon when I get home from school. The cookies sound delicious, with all those different chip flavours. Hope you are staying cozy and warm today. Yikes these look amaaaaazing!! I will be saving this for sure. I’m making your meatloaf for the second time lol! I gave the first one away so this one is to keep and enjoy!! These sound so good and I love your idea of freezing the unbaked balls of dough to pop in the oven when a cookie 'fix' is needed :) Love your Friendly Village set. The scene is perfect for this time of year. I have 2 sets of Johnson Brothers, the Hearts and Flowers that I wanted when I was a new bride and Fruit Sampler that we inherited from my MIL. Sadly, I hardly use either any more. Your cookies look really good and would be nice with a cup of tea! Of course I love your FV teacup and the greenery and pinecones look so cozy with it. It's very cold here so I've been sipping lots of tea and coffee. It's a good time to plant oneself in front of a blazing fire and enjoy some reading and tea. Have a beautiful day, dear Kitty. Hugs. I love oatmeal cookies and I bet they taste really good with the chocolate chips in them. Thanks for sharing this at our Cooking and Crafting with J&J. Enjoy the week. These look really good!! I LOVE your Johnson Bros. Friendly Village Tea cup!! So pretty!! Thanks so much for taking the time to stop by and share your thoughts on my post about blogging. I plan on doing a follow up post soon. I am now following you!! Don't you just love Friendly Village? Great cookies. i wish I was a guest at your house to have some tea and cookies. I could write a comment in one word!! YUM! These look and sound delicious. I think oatmeal may be my favorite cookie but these with all those chips, well...sounds divine!!! Even better with tea! Lovely tea cup btw! Hope all is well with you Kitty! Kitty, that sounds delightful! I love a nice warm cookie and a cup of tea. It's been too long since I've run out of homemade cookie dough in the freezer. Thanks for reminding me to get on that! Your vignette in front of the fire looks so cozy -- perfect for this time of the year. 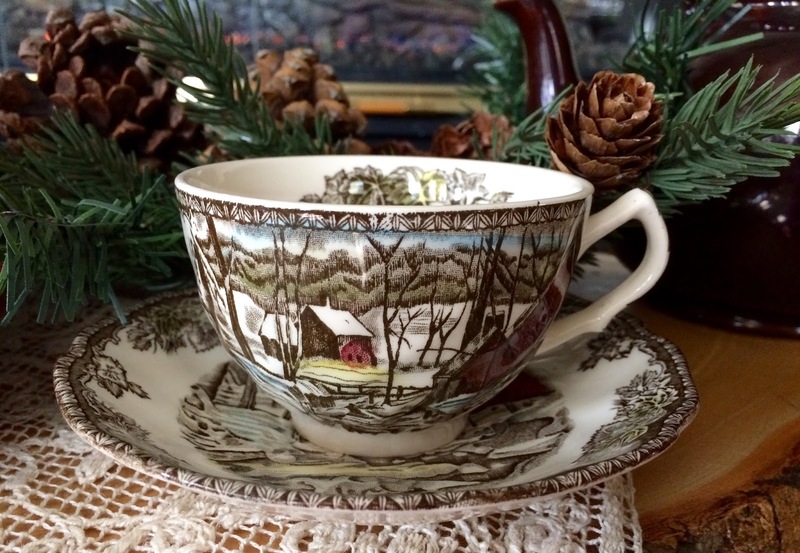 I love the "Friendly Village" teacup and saucer. Do you know, Hal even likes that dish pattern, and he rarely notices dishes like I do. I should get a couple of those cups and saucers. Your cookie recipe looks delish!! It looks very similar to our favorite cookie recipe, which came from Hal's mom. We've been making them for years, and everyone loves them. One day, I'm going to do a post about them on my blog. The cookies look delicious. But I've never heard of cinnamon chips before. It sounds interesting!